Education minister says birth of Israel was not a "catastrophe or shoah"
Arabs refer to period surrounding birth of Israel as al-Nakba - "the catastrophe"
JERUSALEM (CNN) -- Israeli textbooks for Arab school children will no longer say that Arabs refer to the period surrounding the birth of Israel as al-Nakba, or "the catastrophe," Israel's education minister said Wednesday. 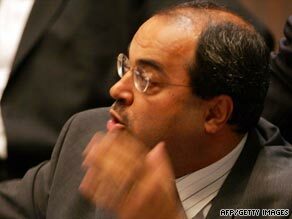 Ahmed Tibi, an Arab member of the Knesset, has slammed the move by the government. In a statement explaining the decision, Gideon Sa'ar said there is "no reason" for the birth of Israel "to be presented as a 'catastrophe or shoah.'" After Israel was created in 1948, a war broke out between the Israelis and Arabs, and some 700,000 Palestinians either fled or were expelled from their homes. Arabs commemorate the displacement every year with Nakba Day. In 2007, under the previous Israeli government, the term was included in a textbook for Arab third-graders in Israeli schools. Sa'ar argued that inclusion of the term contributed to a "process of delegitimization" of Israel and that maintaining the language would "create processes of extremism in the Arab sector"
A passage from the textbook in question, translated by the Israeli daily newspaper Haaretz reads, "The Arabs call the war the nakba -- a war of catastrophe, loss and humiliation -- and the Jews call it the Independence War." Ahmed Tibi, an Arab member of the Knesset, slammed the ministry decision, telling CNN, "Any instruction by any Israeli minister will not abolish the Palestinian narrative. It's an attempt to rewrite the history of the area and to ensure one narrative which is the Zionist narrative. By all means we will continue to commemorate the Nakba every year." An education ministry official told CNN the change to the textbook is part of a larger ministry review of the state curriculum and that Sa'ar did not believe the majority of Israel's Arab citizens viewed events in 1948 as a "catastrophe." Earlier in the week a Knesset committee voted on a separate measure that would deny public money for groups that mark Israel's independence as a day of mourning.